Become inseparable from the commitment beings! Please accept these as well as an ocean of undefiled nectar! May your heart commitment be fulfilled and degeneration restored! We confess with a mind of remorse and regret. Within the unobjectifiable emptiness of the three spheres. I offer, please accept with compassion! Increase their lifespans, merit, and wealth like the waxing moon! In this and future lives! Spontaneously grant our every wish! Accepting, accomplish the yogi’s intended purpose! Like a father caring for his son! Each and every action I request! Milk and curd, set out and envisioned! Be fulfilled, broken bonds be restored! Like a mother, care for your children! Extend Lama’s life and influence! Increase Sangha’s teaching and practice! Like my shadow, never part from me! Clear every hindrance and obstacle! Make conditions favorable, as wished! Nurture and protect us, without break! Now is time to judge the karmic truth! Time to clear the innocent of blame! Time to protect your dharma children! From the heart syllable of myself visualized as the yidam, light rays emanate. 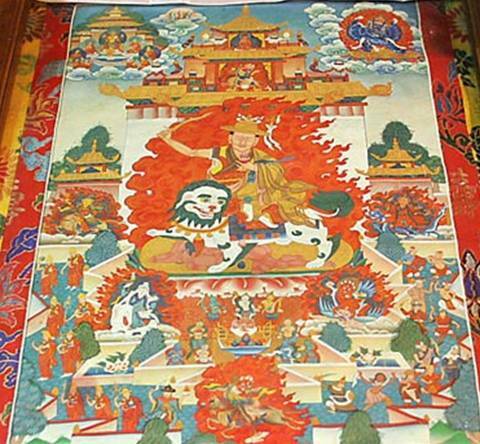 They strike the HUM syllables and surrounding mantra garlands which, matching each deity in colour, stand upon the sun seats at the hearts of Dharmapala Gyalchen Shugden’s five fierce families, exhorting them without choice to perform whatever desired peaceful increasing, powerful, or wrathful activity, without obstruction. OM BENZA WIKI BITRANA SOHA! PANTSA KULA SARVA SHATRUM MARAYA HUM PHAT! To the Dharmapala and his entourage I bow down. Please be patient with all of these. OM SU PRATISHTA BENDZA YE SOHA! By peaceful and wrathful Manjushri from life to life! Dispelling darkness of the three realms’ beings. Swiftly attain the state of Vajradhara. Establish every being without exception in that state. Teachings flourish for a very long time. May there be auspiciousness of the root and lineage Gurus! May there be auspiciousness of the hosts of yidam deities! May there be auspiciousness of the goddesses, dakas, and dakinis! May there be auspiciousness of the Dharma protector guardians! Live forever ’till the end of existence!